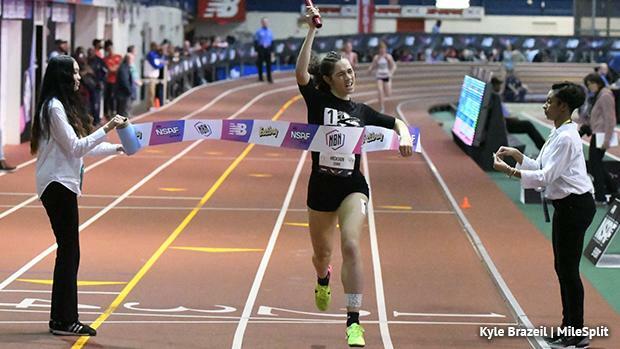 It was a big day for Pennsylvania on Day 2 of New Balance Nationals Indoor. A number of PA athletes took home All American honors and the day was capped off by a national title. The Neumann Goretti girls took home the 4x800-meter relay title in dominating fashion on Saturday evening. The Saints also broke the Pennsylvania state record, which was set two years ago at this very meet by North Penn. NG ran 9:02.17 to beat NP's 9:03.35. NG got three 2:16 splits and then a terrific 2:11 anchor leg from Kami Joi Hickson, who brought it in for the win and national title. It comes on the heels of NG's state meet win a few weeks ago. Mykala Perry led off and put the team in second at the first exchange. Dasia Wilson gave the Saints a 2 second lead at the midway point. From there, Sanaiya Watts extended that lead with the third straight 2:16 split and left it up to Hickson who got the job done. The Saints will return in the 4x400 tomorrow where it will be among the top threats for the title once again. Ezra Mellinger's dream indoor senior season ended on a high note, Saturday, with the Lampeter-Strasburg talent placing second in the Championship Boys Long Jump. Mellinger was consistent in the prelims with three jumps in the high 23-foot range. Then on his first leap in the finals, Mellinger shot up to second with a 24-3, his second time over 24 feet after his terrific indoor state meet performance. The champion, Jieem Bullock from North Carolina, PR'd by over a foot on his first attempt to capture the win. In the Championship Girls Shot Put, Keeley Suzenski of Reading took second overall, also earn All American honors. After a pair of early round 44-footers, the senior launched her best throw on her final attempt with a 45-4.25 to shoot her into second place. Also earning All American status was Germantown Academy's Meaghan Toscano, who threw 44-5.25 to take fourth in the shot put field. State College Area's Stanley Hamilton added an All American performance to his state championship season. Hamilton scored 3,496 points to place fourth on Saturday, getting inside that top 6. Hamilton was very consistent across the board. Hamilton went 8.62 in the 60-meter hurdles, jumped 6.55m in the long jump and closed out the competition with a win in the 1K (2:53.61). On the girls' side, Brianna Smith of Cheltenham placed fifth to earn All American honors. After a seventh place finish last year, Smith put together a very strong day, scoring 3,667 points for a nearly 400 point PR. Smith shined in the high jump (5-8.25) and the long jump (18-0.5) en route to her fifth place performance Saturday. Some PA individuals and relays made it to the next round in their respective events. Davies then came back to run 23.87 in the Championship Girls 200 meter prelims which is the second fastest qualifying time, trailing only Tamari Davis of Florida. Final is 2:59pm. Central Dauphin East pulled in the third fastest time of the prelims in the Championship Boys 4x200-meter relay. The indoor state champs went 1:29.14, not far off their season best to advance to the finals. The final is set for 1:03pm tomorrow afternoon. Talitha Diggs of Saucon Valley showed she's peaking at the right time. Diggs, who won an indoor state title in the 400, was the third qualifier in the event for Sunday's final (tomorrow, 2:13pm). That betters her own PA#1 and improves on her own PR. Diggs then came back to qualify to the Championship 200 meter final with another PR of 24.16. Conestoga Valley's Jane Livingston and Perkiomen Valley's Christina Warren safely advanced to the semis in the Championship Girls 60m hurdles. Livingston clocked a 8.54, while Warren went 8.62 to get through to the semi, set for 11am Sunday. Carlisle's national record in the DMR went down on Friday night. The Loudoun Valley boys, which featured Sam Affolder on the anchor leg, went 9:54.91 for the win. Affolder ran the 1200 leg on Carlisle's record-setting DMR two years ago along with his brother Noah Affolder. There were a pair of strong performances in the Emerging Elite (EE) 2 mile. In the boys' race, Ian Miller of Manheim Township ran a PA#1 time of 9:28.41 for eighth. Then in the girls' race, Cedar Crest's Gwyneth Young ran 10:50.29 to place fifth.